Simon Mayor is one of the world's leading mandolinists as well as a fine fiddle player, guitarist, composer and wit. His live performances are a riot of humorous anecdotes and off-the-cuff wit alongside dazzling musicianship. With Simon Mayor's first note the audience came to life. It was they who made sitting on a hard seat 'til midnight worth it. Simon is a genius... add to that a warm, funny, relaxed manner and you have a monstrously enjoyable evening. 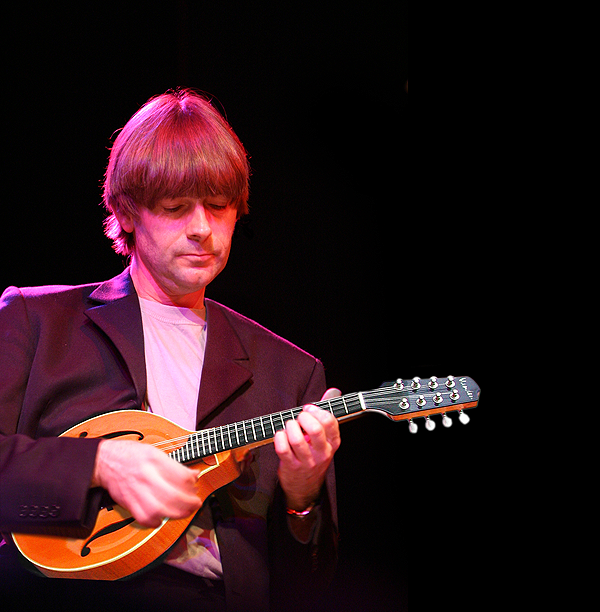 With his debut 'The Mandolin Album', he embarked on a series of recordings to realise his longstanding intention to give the mandolin a uniquely British voice. The CD was immediately made Recording Of The Week on BBC Radio 2 and received huge popular and critical acclaim. Many albums later, his mix of original and traditional material alongside classical showstoppers has been heralded across the media from BBC World Service (Recording of the Week) to stations all over the USA and Canada and magazines as diverse as Q, Cosmopolitan, Living Tradition (Scotland) and Sing Out (USA). His passion for the mandolin surfaces again in a wealth of teaching books and DVDs, including 'New Celtic Mandolin' and 'The Mandolin Tutor', which is now widely regarded as the standard work for the instrument. He is also a regular columnist for Acoustic Magazine. In May 2000 he entered the UK's Classical Artist Top Ten with a major 'best of' release of his own compositions and classical works on Universal Records. His touring schedule has taken in festivals and theatres all over the world including the Rudolstadt International Folk Festival (Germany), Shetland Folk Festival, Vancouver Folk Festival, The Stephen Leacock Humour Festival (Canada), Cheltenham Literature Festival (England), Edinburgh Fringe (Scotland), The Classical Mandolin Society of America and many, many more. His off-beat humour surfaced in his own series for the BBC, 'Marooned with a Mandolin' - "the best programme on Radio 2 this week" in The Independent on Sunday. He now leads Britain's first modern mandolin quartet, the Mandolinquents. The quartet emerged from a 1997 line up, The Mandolin All-stars with multi-instrumentalists Maartin Allcock and Chris Leslie of Fairport Convention, and long time musical partner, Hilary James. Originally intended as an occasional all-star get-together, fast growing demand meant that a permanent line-up had to be found. The Mandolinquents now includes the renowned classical guitar virtuoso Gerald Garcia, UK banjo champion, Richard Collins and 'one of Britain's finest voices' Hilary James doubling on mandobass. A fine fiddle player, he played swing fiddle on the album for the show Five Guys Name Mo, and he likes to keep his hand in playing occasional folk fiddle for country dances when schedules allow. He now tours regularly with long-time partner Hilary James. The duo share a keen interest in children's music and have worked extensively with young people in theatres and schools. They have also presented Play School and for six years were regular hosts of BBC Music Education programmes. They have written over fifty children's songs, many for their own 'Musical Mystery Tour' children's CDs and the 'Musical Mystery Tour' songbook published by Faber Music. The songs have also featured on classic British children's series such as Play School, Listening Corner and Green Claws and are used extensively in education, including English language teaching courses for Danish schoolchildren. Alongside www.mandolin.co.uk they set up www.childrensmusic.co.uk in 1999. Simon Mayor and Hilary James have also written satirical and topical songs for BBC news programmes including Newsnight. A huge fan of fellow Yorkshireman, the late, great Jake Thackray, Simon occasionally performs a special programme of Jake's songs.